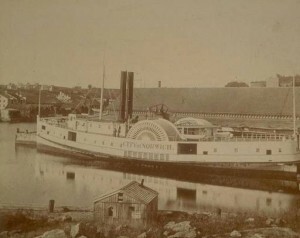 For waterfront towns like Norwich (located on the Thames River), early steamships offered opportunities for travel and commerce previously unthinkable to generations of local residents. In addition to providing reliable transportation to cities like New York, New Haven, and Providence, steamships operating out of Norwich allowed New England goods manufacturers to reach customers all along the eastern seaboard. By 1840, steamships leaving Norwich reached important markets like New York and Boston in less than a day. Right around this time, as a project to build a canal from Norwich to Worcester, Massachusetts, met with interminable delays, the construction of the Norwich & Worcester railroad reached completion. This next stage in the development of early transportation in Connecticut allowed travelers and manufacturers to overcome the irregular nature of the New England coastline and the congestion found in isolated areas like Manhattan Island, through the use of a combined water-and-rail system. The Norwich & Worcester railroad opened new markets for Norwich businesses—helping local industries like the growing firearms manufacturers in town. The rail-water system fostered industrial development by increasing the speed of travel and, thus, reducing the costs of obtaining raw materials and shipping out finished products. 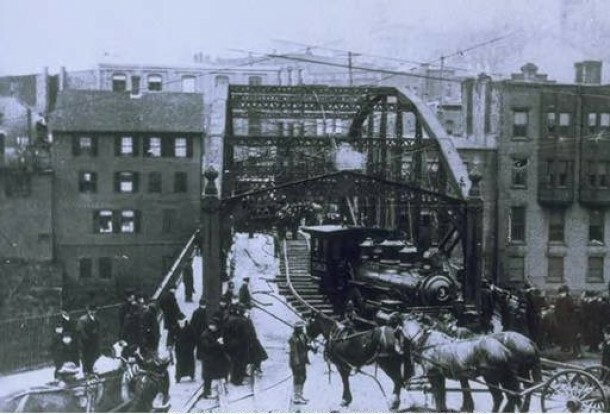 For nearly a century, Norwich acted as a hub for people and goods traveling between Boston and New York. The journey involved railroad travel to Norwich followed by overnight steamboat passage to the either of the two cities. This water-rail model proved so successful that steamboat lines and railroad companies merged throughout the mid-19th century in order to compete with the likes of the Norwich line. As a result, by 1903, railroad companies controlled every major steamship line in the area. The cost-effective nature with which these partnerships operated allowed New England businesses to remain competitive with larger, urban manufacturing centers throughout the Northeast. It took the development of motorized highway transportation to eventually surpass the efficiency of the water-rail system.